Should We Ditch The Tube Map? 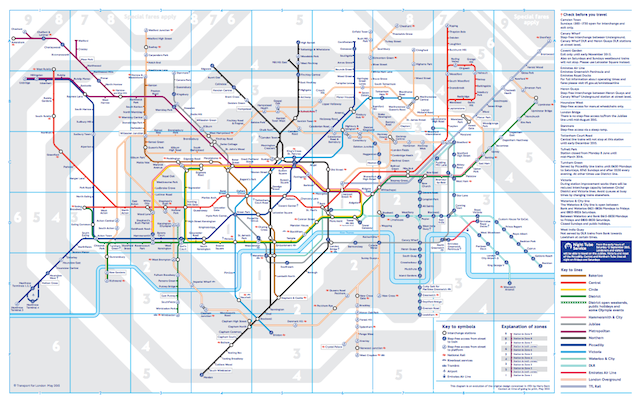 M@ Should We Ditch The Tube Map? This article was originally published in 2013, and has been updated to reflect recent additions to the map. We're going to suggest something that many will regard as heretical. Sorry. Rather than continuing to update the increasingly cluttered Tube map, might we one day ditch it entirely? Could a souped-up journey planner ever have a persuasive number of advantages over a static map, enough to render the old way of doing things obsolete? Could our generation's Tube map be the last? Before we go on, it's important to stress that we're arguing about the future here, not the present. Transport for London's journey planner has many limitations and disadvantages, and there's no way it could currently replace the tried-and-tested Tube map. Not yet. But think about how far things have come in the past ten years, how we've gone from limited WAP devices possessed by only a few, to a city where more than half of us own a touch-screen smartphone. Where will these technologies be 10 or 20 years from now, and how ubiquitous? No one knows the answer to that. But two trajectories — the increasing complexity of the Tube map, and the increasing usability of mobile technology — could point to the latter supplementing, and eventually replacing, the former — not just for tech geeks, but for everyone. Maps of the Underground have been around for over 100 years, but reached maturity with the designs of Henry Beck, first introduced 80 years ago. His maps are rightly regarded as icons of good design, were voted the second-favourite British design of the 20th Century (behind Concorde), and have even featured on commemorative stamps. But there are numerous problems and limitations with this visualisation. And they're getting worse. 1. It's cluttered. Since Beck's time, two new Tube lines have been added (Victoria and Jubilee), the Piccadilly line is longer, and the sizeable DLR and Overground systems have pretty much doubled the number of stations displayed. There's even a cable car. Add on the zone boundaries, interchange marks for boats and mainline rail, and accessibility symbols, and the network is looking rather crowded. Compare a Beck original to the modern map. 2. It's incomplete. The map only shows rail routes operated by Transport for London. Many useful services, such as the Thameslink route through central London, are absent, while relatively little-used or infrequent services (such as the Barking to Gospel Oak Overground line) are present. It's a decidedly incomplete picture of how to move around, reflecting a political reality rather than a passenger reality. 3. Completing it confuses it. Maps are available showing all London rail routes, but these are hideously complex and difficult to use for anyone unfamiliar with the network. Just look at the area around Lewisham in this map. 4. It's static. A paper map on a wall or in your pocket cannot display line closures or unexpected delays. You have to seek a second source of information to find this out. 5. More problems ahead. Crossrail will be part of Transport for London's network and should be featured on maps from 2018. Cutting through the crowded centre of the map, it's sure to make legibility even worse. We've also heard rumours that the updated Thameslink might be added at some point. And with the Mayor keen to take over all of London's rail services, there could be yet more to add. 1. Simplification. When making a journey, you don't need to know what the whole network looks like. If you're travelling from Heathrow to Paddington, you don't care where the Northern Line branches, or how the Central Line loops. All you need to know is the quickest way from A to B. 2. Updatable and adaptable. If the quickest way from A to B suddenly grinds to a halt (signal failure, for example), a digital journey planner should be able to find an alternative route and tip you off. 3. Multilingual. Don't speak English? No problem. Just say or type "How do I get to Bank?" in your language of choice and a decent journey planner of the future should be able to sort you out in your own tongue. 4. Expandable. In contrast to a paper map, which gets increasingly cluttered the more lines and options you add, a digital system can be added to without hindrance of space, and without the cost of distribution. 5. Integration. If designed well, the journey planner could also display 'bolt-ons' for more confident users. You've reached your destination, now where are the local cab stands/florists/pubs/etc. Recommending local services could even become a new revenue stream for TfL. 6. Profit. Aside from user advantages, an adaptable journey planning system could be very lucrative for whoever develops it. London is not the only mass transit system in the world, and some are more complex still. The ideal system would be readily adaptable to these other markets. Again, it's important to think beyond the technology that's commonplace now, to what might be just around the corner. Many of the above features already exist within the soup of transport apps available for smartphones. Some are good, but none has yet got close to capturing the capital's imagination. The software might be sleek, but the cumbersome hardware (get phone out of pocket, turn on, find app, type in journey details...) and lack of design integration with the physical world, mean that most people will still favour the good old-fashioned map. But today's hardware is unlikely to be the tech of choice a decade from now. For example, Google is working up to launching its 'Glass' product — a pair of glasses that display digital information to the wearer. Such a system might be ideal for way-finding on the Tube. The wearer could simply say "Glass...how do I get from here to Paddington", and a series of arrows, visible only to the user, would lead the way. The experience would be totally hands-free, from ticket hall to platform to train, to interchange, to destination. No maps needed, just follow the arrows. The current situation is messy, with many competing technology platforms, and many competing apps. If digital navigation can ever supplant the Tube map, it will need a Beck-like genius to tie everything together in a universally accessible and well-thought-out design. Indeed, that person or team would have to overcome even more challenges than Beck, as a winning system would have to hook together intuitive visuals with good software and database design, and be adaptable to different devices and locations. However much technology advances, there will always be the 'I prefer to see a real, physical copy' argument, familiar from the endless debate about books versus ebooks. There's something about maps that humans find irresistible. You'll note that we have a 'Maps' tab on the site's main navigation bar up top — and many of the maps therein show inventive variations on the Tube network. It's there on our menu because people love maps, and our viewer stats back that up. Can we really ever give up something as beautiful as the Tube map for an alternative, even if it could be more efficient and adaptable? The second part of this article will argue for the continuance of paper maps, but we welcome opinions in the meantime. These thoughts were inspired, in part, by the exceptional work of Max Roberts, whose recent book Underground Maps Unravelled picks apart the design and psychology of Tube maps in exquisite detail. His work speculates on the many ways the standard map could be altered, enhanced or ruined by tweaking the design principles. But it also prompted us to ponder whether there might now be better solutions than lines on paper. Max Roberts has now responded to this article with a riposte, saying that the Tube map is here to stay. See also our critique of the updated tube map, which includes many new Overground stations.